Fall wasn't here long in Iowa, and I sure hope that winter shows up quickly. Neighboring states are on the ice or getting very close as I publish this. Iowa ice anglers, our turn will be next. It is time to get the gear ready and brush-up on our electronics that will help us this ice season. This past weekend I had the opportunity to present a seminar at the new Clear Lake Bait and Tackle shop representing Vexilar. 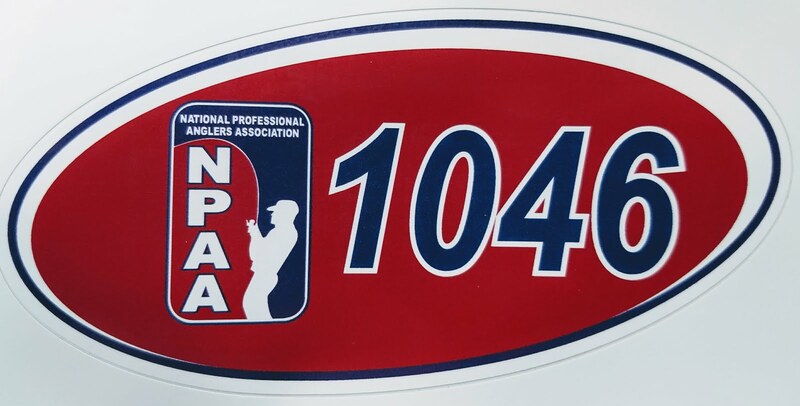 At this event I presented to about 60 anxious ice anglers trying to gather as much information as they could to help them land a few extra fish this upcoming ice fishing season. Each and every time I present tips and tricks about using a Vexilar to its fullest, I see the same "ah-ha" looks in the crowd. 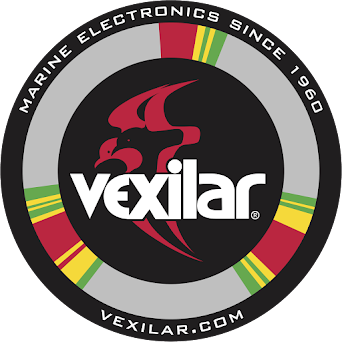 I want to pass along the biggest items that anglers at my seminars learn from so you too can learn and catch more fish using your Vexilar. As ice anglers we choose to use electronics to help us tell us many things. In this illustration we can see a Vexilar read-out with the bottom being at about 12 feet. We also see that our jig is at the 10 foot level in the water column. The part that is the most important is the green line showing us a fish is below us. Remember, green and yellow lines are signals that are away from the center of the signal from the Vexilar transducer. So, the fish signal shows up at about 11 feet of water, but as we can see in the picture the fish is actually swimming at 10 feet. 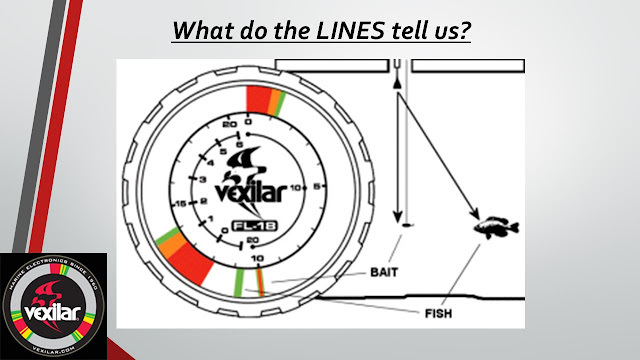 This illustration shows/reminds us that we always need to fish above any green or yellow mark on the Vexilar. If you need more information about this picture or tip, just drop me an email. I will also be at Hank's Bait and Tackle Ice Fishing Open House November 30th. As November fades away, so does another season. Fall has come and gone but it wasn't without some fantastic river fishing. 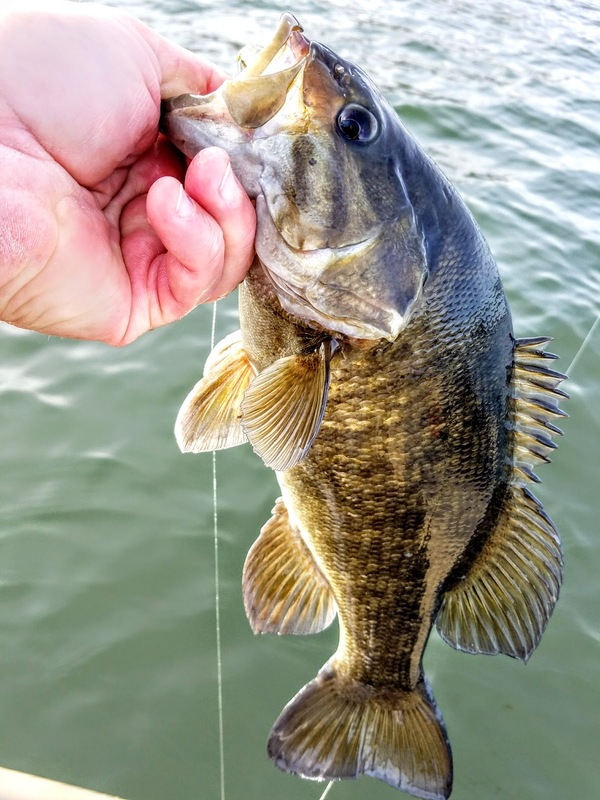 Largemouth started the fall season, but when the calendar turned to November, the smallmouth showed up and they were plentiful. 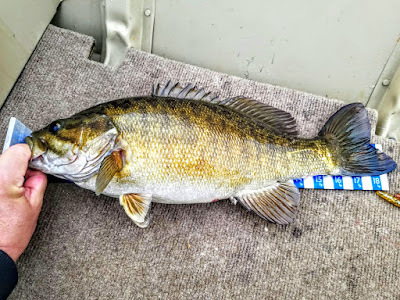 Depending on the current of the river and the weather for the day smallmouth found there way into the boat time after time. The Hot Rod Baits tubes were fantastic and when the weather wasn't the best, small finesse worms fooled the smallies. It was a blast sharing the Ranger and the small jon boat on the river with family and friends. As Thanksgiving approaches my attention has once again turned towards ice fishing. I'm not saying that all my Quantum rods and reels are put away, but the time is certainly right around the corner for just that.